At the American Legislative Exchange Council (ALEC) 2015 annual meeting in San Diego, California, dirty energy companies and their supporters--including ExxonMobil, Chevron, and Duke Energy--continue to dominate the funding of activities, according to a list of conference sponsors obtained jointly by the Center for Media and Democracy and Greenpeace. At the top of the agenda, Wisconsin Governor Scott Walker spoke to ALEC delegates over breakfast on Thursday. Walker is now campaigning on a promise to destroy the Environmental Protection Agency (EPA) if elected President in 2016, a plan which was earlier debated by ALEC at its December 2014 conference and is in line with ALEC’s long-term legislative agenda. At ALEC conferences and meetings, rhetoric against the EPA--and in particular the Obama administration’s proposed Clean Power Plan to reduce carbon pollution--is frequently extreme. ALEC sessions have repeatedly featured overt denial of climate change science. During recent ALEC conferences, legislators have been called upon to engage in “guerrilla warfare” against the EPA and at another session instructed to bring about a “political tsunami” to block pollution controls. After Google chairman Eric Schmidt accused ALEC of "literally lying" about climate change on NPR in September 2014, a fleet of companies ditched ALEC, from oil giants like BP and Occidental Petroleum to software and tech firms like Facebook, Yelp, Yahoo, AOL, eBay, and SAP--the company which chaired ALEC's corporate board. On the agenda during the San Diego closed-door meeting of the ALEC Energy, Environment and Agriculture task force are numerous new attempts to undermine efforts to tackle climate change. The proposed ALEC model "Environmental Impact Litigation Act," based on a law passed in North Dakota in 2015, would allow coal, oil, and gas companies to pay into a fund for the state to sue against a number of key federal environmental laws, including the Clean Air Act. This law, if passed, could be used to allow coal companies to fund state lawsuits against the Clean Power Plan. Of the 54 identified corporate sponsors, twenty-two are energy related firms, their front groups, or firms representing energy interests. 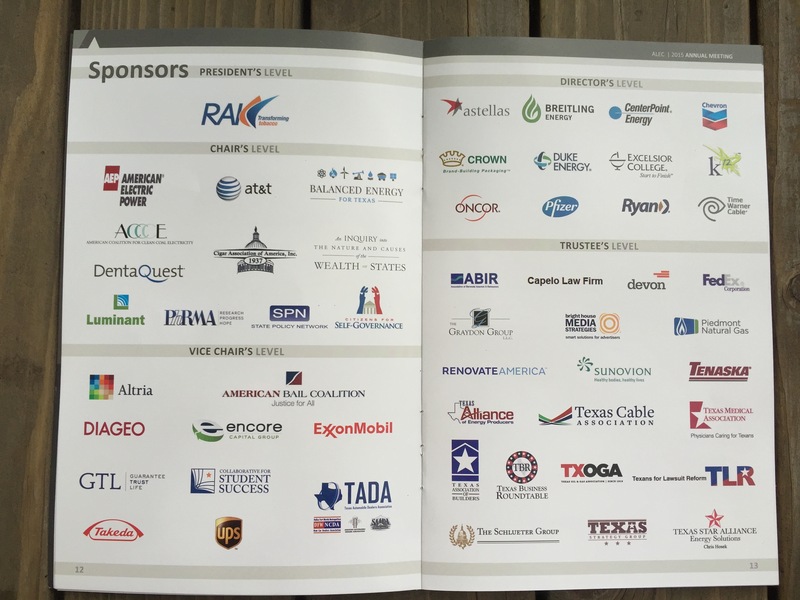 Most notable among the sponsors is ExxonMobil, which just last week told the Guardian that it isn't sponsoring climate change denial groups, including ALEC specifically. ExxonMobil is among the top sponsors of ALEC's 2015 annual meeting, and Exxon's Cynthia Bergman remains on ALEC's corporate board. Below are financial underwriters of ALEC’s meeting, taking place at one of the largest resorts on the West Coast, along with the rates from another document obtained by CMD, ranging from $5,000 to $100,000. For the full page of corporate logos sponsoring the ALEC conference see here.